The ancient cold front can be seen at the left of the image, drifting away from the much inner, younger front closer to the centre. 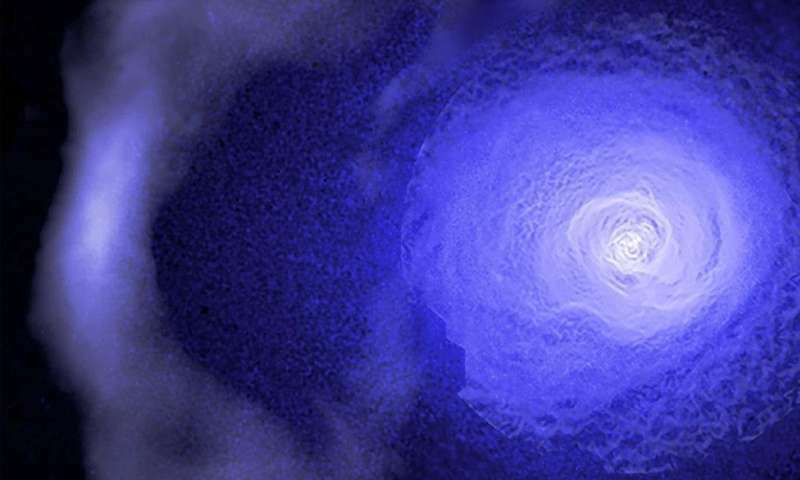 Galactic cold fronts are nothing like the cold fronts we experience on Earth – instead they are caused by galaxy clusters colliding into one another. The gravitational pull of a larger cluster tugs a smaller cluster closer, resulting in gas in the core of the cluster being sloshed around like liquid in a glass. This creates a cold front in a spiral pattern moving outwards from the core and these sloshing cold fronts can provide a probe of the intercluster medium. The sharpness of the cold front suggests it has been preserved by strong magnetic fields wrapped around it, essentially acting as a shield against the harsh environment. An intergalactic Birkeland current, contrary to the blather in the article the structure is being held together by the pinch effect of plasma. Nope, you are just making sh!t up again. Do you ever stop? Field aligned currents, they are ubiquitous in plasmas. Would that be similar to a house current at an electrical outlet?